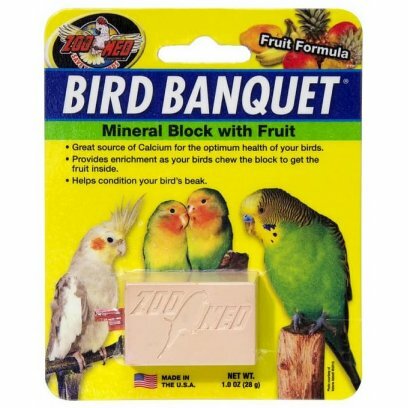 Zoo Med's Fruit Formula Bird Banquet is designed to add necessary digestible calcium to your bird's diet while also helping to keep your bird's beak trimmed and thus helping to prevent overgrowth. 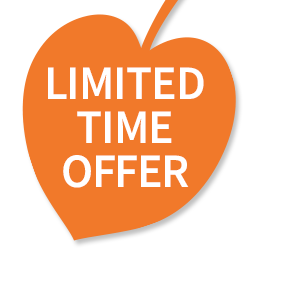 This formula includes a mixture of nutritious fruits (Mango, Banana, Papaya, and Pineapple) in a solid Calcium base. 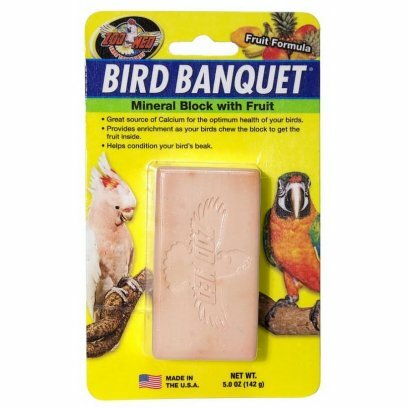 Zoo Med's Original Formula Bird Banquet is designed to add necessary digestible calcium to your bird?s diet while also helping to keep your bird's beak trimmed and thus helping to prevent overgrowth. 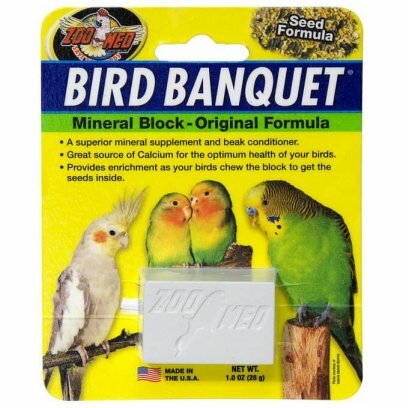 This formula contains a mixture of nutritious seeds (White Millet, Canary Grass Seed, and Oat Groats) in a solid Calcium base. 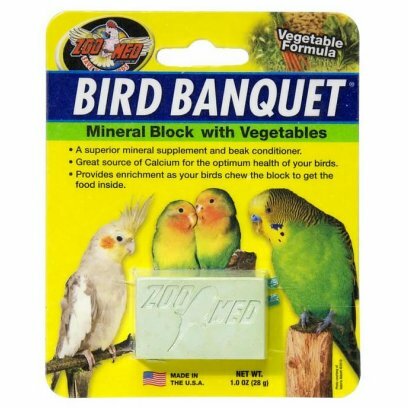 Zoo Med's Vegetable Formula Bird Banquet is designed to add necessary digestible calcium to your bird?s diet while also helping to keep your bird's beak trimmed, thus helping to prevent overgrowth. This formula includes a mixture of nutritious vegetables (Carrot, Spinach, and Suncured Alfalfa) in a solid Calcium base. 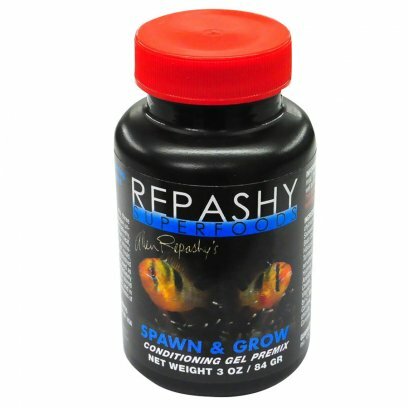 INGREDIENTS: Krill Meal, Insect Meal, Mussel Meal, Squid Meal, Dried Brewer?s Yeast, Dried Seaweed Meal, Lecithin, Dried Kelp, Locust Bean Gum, Potassium Citrate, Taurine, Watermelon, RoseHips, Hibiscus Flower, Calendula Flower, Marigold Flower, Paprika, Turmeric, Stinging Nettle, Garlic, Salt, Calcium Propionate and Potassium Sorbate (as preservatives), Magnesium Amino Acid Chelate, Zinc Methionine Hydroxy Analogue Chelate, Manganese Methionine Hydroxy Analogue Chelate, Copper Methionine Hydroxy Analogue Chelate, Selenium Yeast. Vitamins: (Vitamin A Supplement, Vitamin D3 Supplement, Choline Chloride, Calcium L-Ascorbyl-2-Monophosphate, Vitamin E Supplement, Niacin, Beta Carotene, Pantothenic Acid, Riboflavin, Pyridoxine Hydrochloride, Thiamine Mononitrate, Folic Acid, Biotin, Vitamin B-12 Supplement, Menadione Sodium Bisulfite Complex). 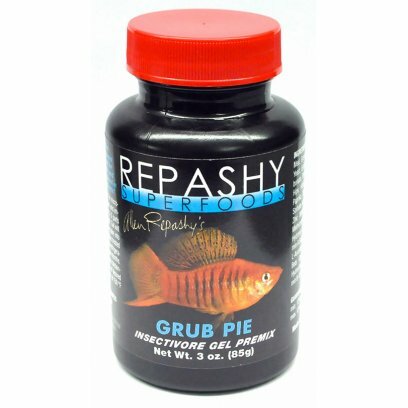 A Meal Replacement Gel for Omnivorous Species of Freshwater Fish and Aquatic Invertebrates. 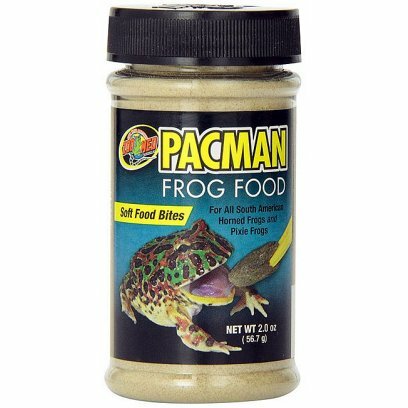 INGREDIENTS: Krill Meal, Alfalfa Leaf Meal, Squid Meal, Pea Protein Isolate, Fish Meal, Stabilized Rice Bran, Dried Seaweed Meal, Dried Brewer?s Yeast, Ground Flaxseed, Algae Meal, Lecithin, Dried Kelp, Locust Bean Gum, Potassium Citrate, Guar Gum, Taurine, RoseHips, Hibiscus Flower, Calendula Flower, Marigold Flower, Paprika, Turmeric, Salt, Calcium Propionate and Potassium Sorbate (as preservatives), Magnesium Amino Acid Chelate, Zinc Methionine Hydroxy Analogue Chelate, Manganese Methionine Hydroxy Analogue Chelate, Copper Methionine Hydroxy Analogue Chelate, Selenium Yeast. Vitamins: (Vitamin A Supplement, Vitamin D Supplement, Choline Chloride, Calcium L-Ascorbyl-2-Monophosphate, Vitamin E Supplement, Niacin, Beta Carotene, Pantothenic Acid, Riboflavin, Pyridoxine Hydrochloride, Thiamine Mononitrate, Menadione Sodium Bisulfite Complex, Folic Acid, Biotin, Vitamin B-12 Supplement). 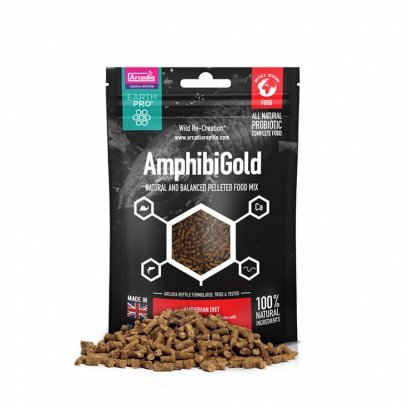 Our Carotenoid Gel Supplement for occasional direct feeding, or adding to other Repashy Gel formulas to enhance the diet of Fish (up to 10% of feed). 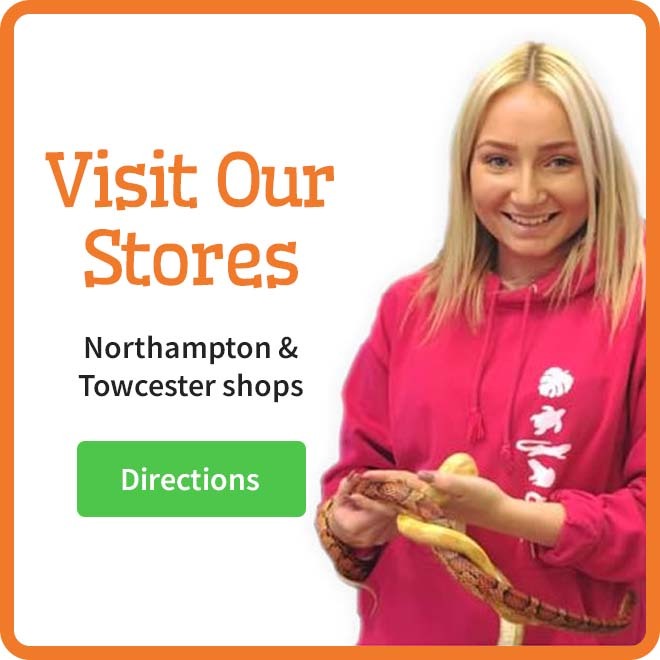 INFORMATION: Contains a ?broad spectrum? 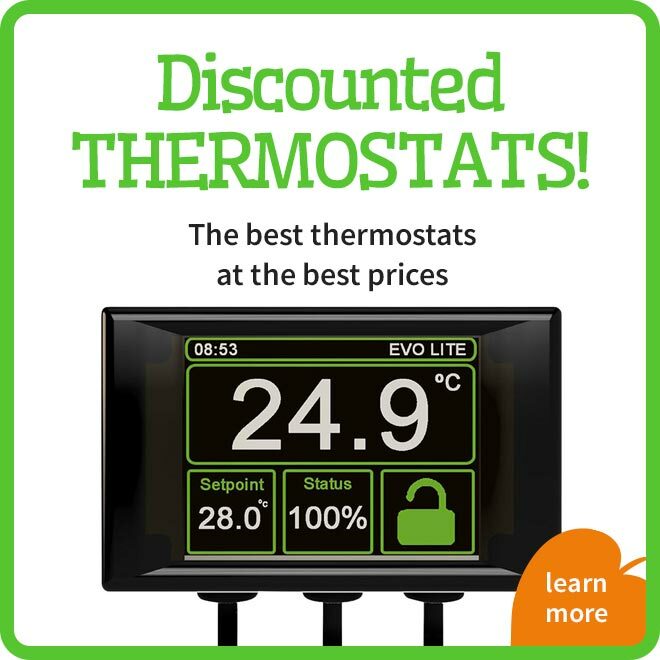 of Carotenoids from whole ingredients (no synthetics). 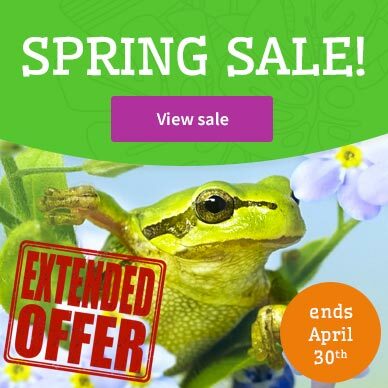 Including, but not limited to: Astaxanthin, Capsanthin, Capsorubin, Apsorubin, Beta-Carotene, Alpha Carotene, Beta Cryptoxanthin, Zeaxanthin, Neoaxanthin, Cucurbitaxanthin, Violaxanthin, Lutein, Echineone, Canthaxanthin and Lycopene. INGREDIENTS: Krill Meal, Calendula Flower, Pfaffia Rhodozyma Yeast, Paprika, Marigold Flower, Spirulina, RoseHips, Hibiscus Flower, Turmeric, Lecithin, Calcium Propionate and Potassium Sorbate (as preservatives), Magnesium Amino Acid Chelate, Zinc Methionine Hydroxy Analogue Chelate, Manganese Methionine Hydroxy Analogue Chelate, Copper Methionine Hydroxy Analogue Chelate, Selenium Yeast. Vitamins: (Vitamin A Supplement, Vitamin D Supplement, Choline Chloride, Calcium L-Ascorbyl-2-Monophosphate, Vitamin E Supplement, Niacin, Beta Carotene, Pantothenic Acid, Riboflavin, Pyridoxine Hydrochloride, Thiamine Mononitrate, Menadione Sodium Bisulfite Complex, Folic Acid, Biotin, Vitamin B-12 Supplement). 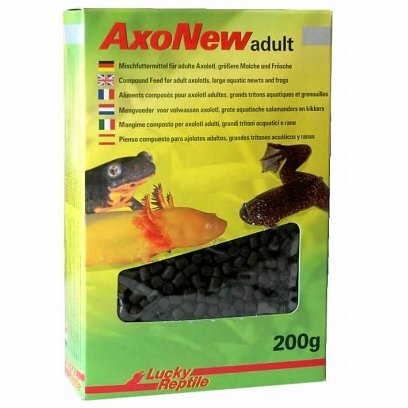 A Meal Replacement Gel for Aufwuchs (Algae and Small Living Organisms) Eating Species of Fish, Invertebrates, Amphibians and Reptiles. 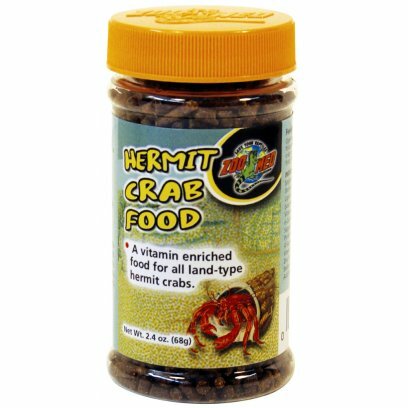 INGREDIENTS: Spirulina Algae, Algae Meal (Chlorella), Krill Meal, Pea Protein Isolate, Squid Meal, Rice Protein Concentrate, Fish Meal, Alfalfa Leaf Meal, Dried Brewer?s Yeast, Stabilized Rice Bran, Flax Seed Meal, Schizochytrium Algae (Source of DHA), Dried Seaweed Meal, Lecithin, Dried Kelp, Locust Bean Gum, Potassium Citrate, Guar Gum, Taurine, RoseHips, Hibiscus Flower, Calendula Flower, Marigold Flower, Paprika, Turmeric, Salt, Calcium Propionate and Potassium Sorbate (as preservatives), Magnesium Amino Acid Chelate, Zinc Methionine Hydroxy Analogue Chelate, Manganese Methionine Hydroxy Analogue Chelate, Copper Methionine Hydroxy Analogue Chelate, Selenium Yeast. Vitamins: (Vitamin A Supplement, Vitamin D Supplement, Choline Chloride, Calcium L-Ascorbyl-2-Monophosphate, Vitamin E Supplement, Niacin, Beta Carotene, Pantothenic Acid, Riboflavin, Pyridoxine Hydrochloride, Thiamine Mononitrate, Menadione Sodium Bisulfite Complex, Folic Acid, Biotin, Vitamin B-12 Supplement). 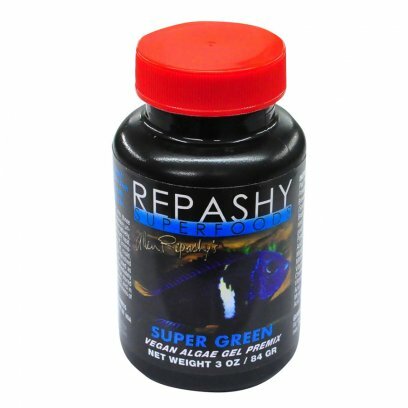 This formula is specifically designed for freshwater green algae grazing species of fish and invertebrates. It contains moderate levels of protein and the first two ingredients are Chlorella and Spirulina Algae. 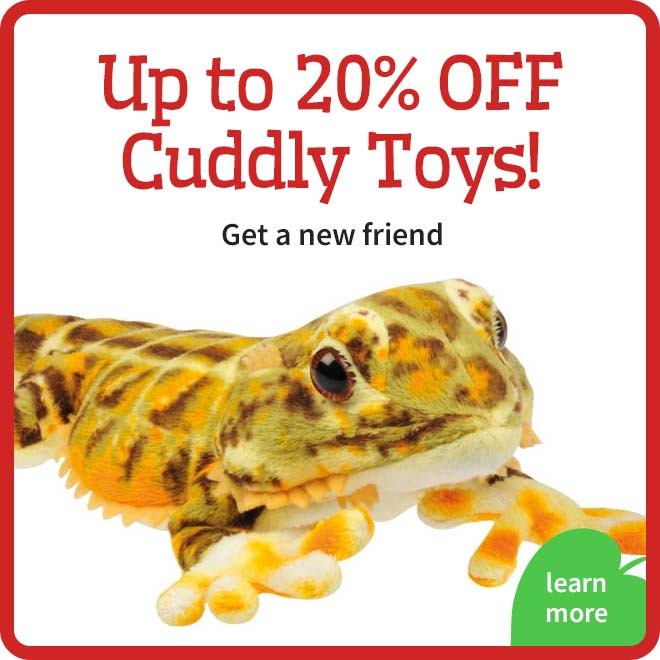 This formula contains no animal based ingredients and is Vegan. This makes it quite different from our ?Soilent Green? 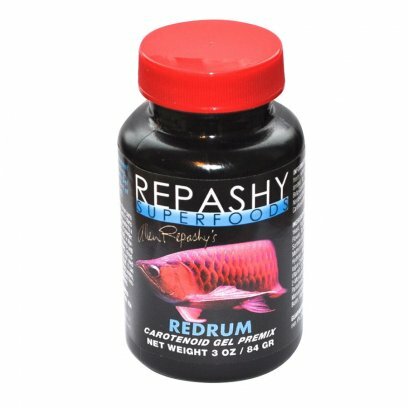 formula which also contains high levels of green algae, but contains whole fish, squid, and krill ingredients. 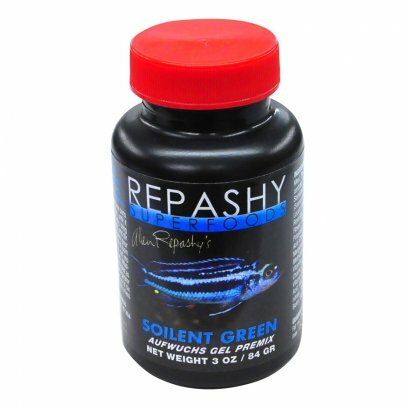 INGREDIENTS: Chlorella Algae, Spirulina Algae, Pea Protein Isolate, Germinated Brown Rice Protein Concentrate, Alfalfa Leaf Powder, Stabalized Rice Bran, Dandilion Powder, Dried Brewers Yeast, Flax Seed Meal, Schizochytrium Algae, Chondrus Algae, Konjac, Carob Bean Gum, Ascophyllum Algae, Potassium Citrate, Calcium Propionate, Dicalcium Phosphate, Taurine, Phaffia rhodozyma yeast, Paprika Extract, Calendula Flower Powder, Marigold Flower Extract, Rose Hips Powder, Turmeric Root Powder, Malic Acid, Sodium Chloride, Canthaxanthin, Potassium Sorbate, Magnesium Gluconate, Lecithin, Rosemary Extract and Mixed Tocopherols (as preservatives), Vitamins (Vitamin A Supplement, Vitamin D Supplement, Choline Chloride, Ascorbic Acid, Vitamin E Supplement, Niacin, Beta Carotene, Pantothenic Acid, Riboflavin, Pyridoxine Hydrochloride, Thiamine Mononitrate, Menadione Sodium Bisulfite Complex, Folic Acid, Biotin, Vitamin B-12 Supplement). DIRECTIONS: To prepare one cup of product, add ? cup of powder into ? cup of water and stir until blended. Microwave until it starts to boil (typically 2-3 minutes), remove and stir. 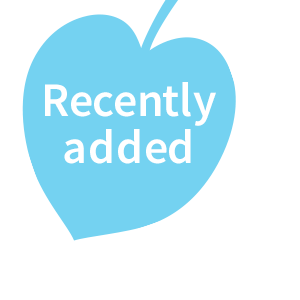 Alternatively, bring water to a boil on stove or in microwave, remove from heat, and stir in powder. 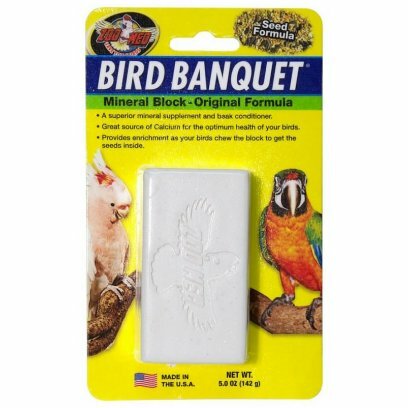 Immediately pour into a storage container, mold, or onto desired surface and let sit at room temp until firm. The finished gel can be cut into cubes, shredded, or used as a whole slab. 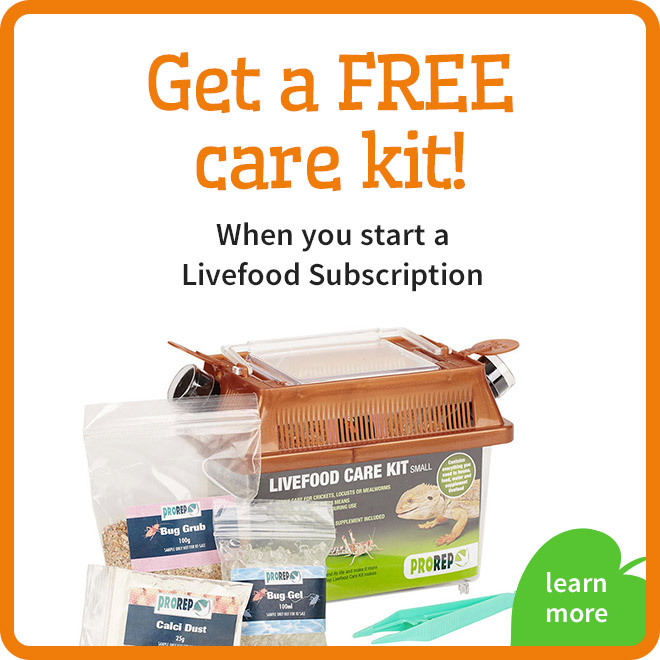 Whatever is not used immediately should be treated as fresh food. 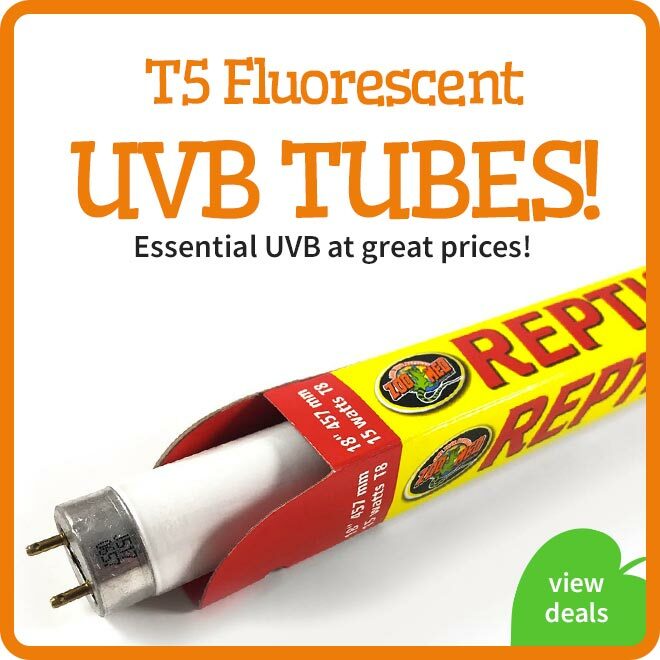 It can be stored sealed in refrigerator for up to two weeks, and in freezer for up to six months. To adjust firmness of gel, use more or less water as desired. 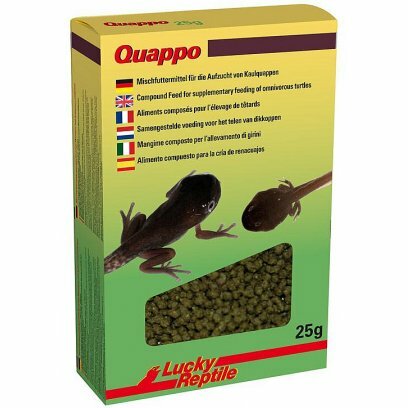 Lucky Reptile Quappo is the food of choice when it comes to successfully rearing tadpoles. 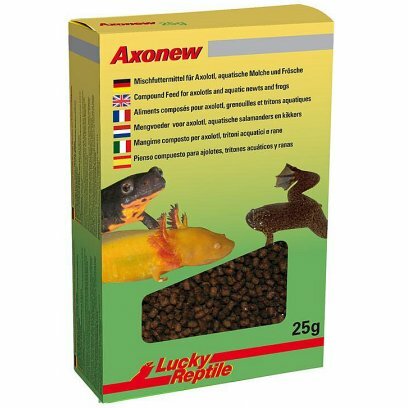 The pellets provide enough proteins, algae and other vegetarian nutrients, that are important for a healthy development from tadpole to frog. 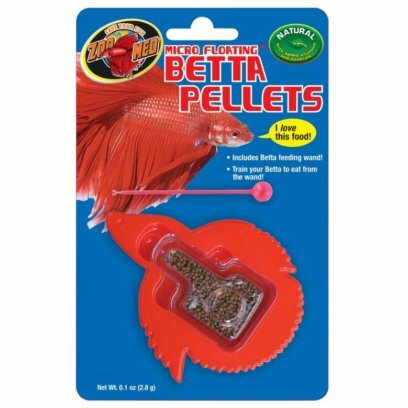 Ingredients: Fish Meal, Dried Potato Products, Wheat Gluten, Dicalcium Phosphate, Calcium Carbonate, Sodium Phosphate, L-Ascorbyl-2-Polyphosphate (stabilized source of Vitamin C), Choline Chloride, Vitamin E Supplement, Niacin Supplement, d-Calcium Pantothenate, Riboflavin Supplement, Thiamine Mononitrate, Biotin, Pyridoxine Hydrochloride, Folic Acid, Vitamin A Supplement, Vitamin D3 Supplement, Vitamin B12 Supplement, Inositol, Magnesium Sulfate, Ferrous Sulfate, Copper Sulfate, Sodium Selenite, Potassium Iodate. 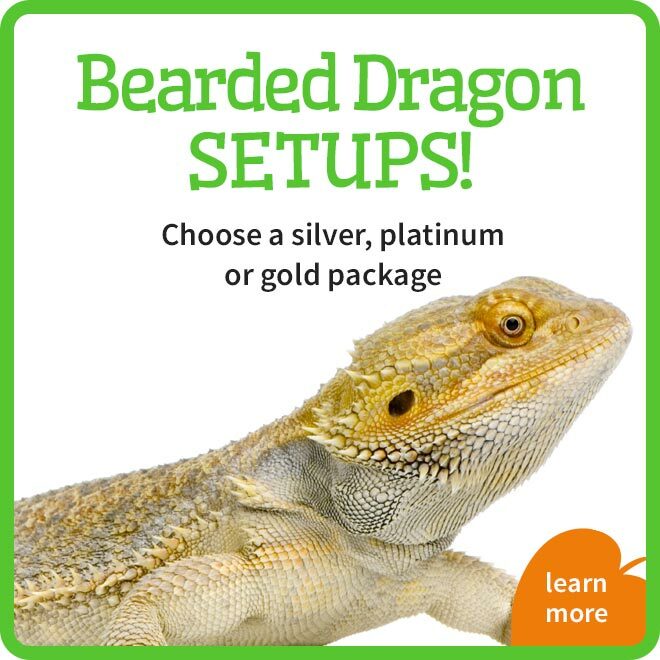 Supplements and complete diets for rare or less common pets. 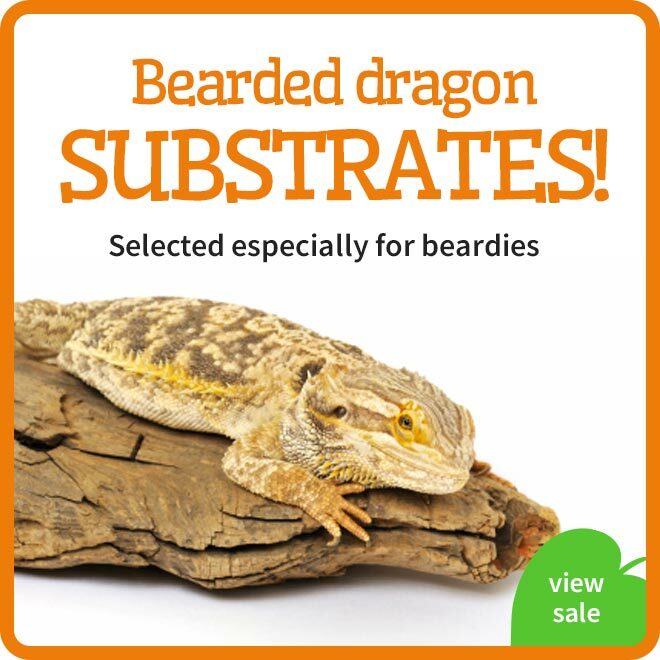 We have included a range of diets for fish, crustaceans and amphibians. 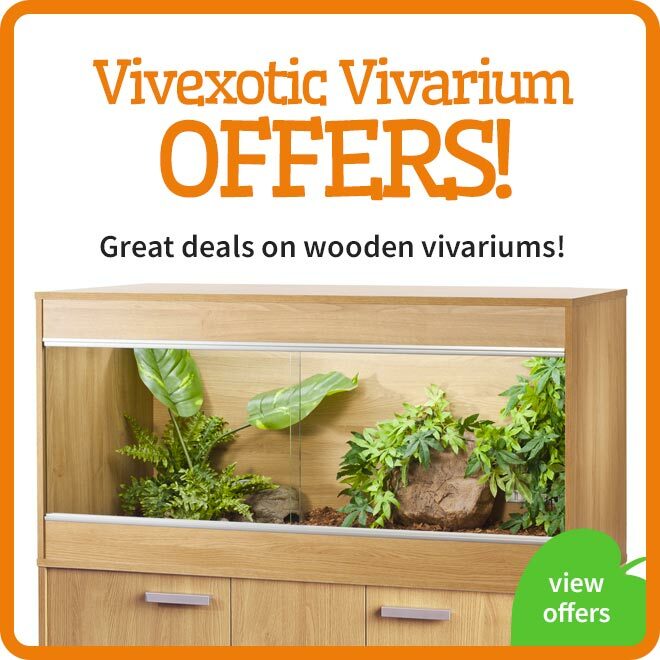 These items range from specialist fish foods to complete newt and axolotl diets.